Kairos Autonomi, Inc., a world leader in robotic appliqué kits and developer of the Pronto4 Robotic Appliqué Kit, has announced that current users of the Pronto4 can trade-in their existing Pronto4 Series 2 or 3 and be upgraded to the latest version of the kit, the Pronto4 Series 4. The upgrade option offers significant savings over the purchase of a new kit. The modules are connected via a standard frame and backplane that is available in two sizes: the Pronto4 Series 4 Mini provides 4 utility bays; and the Pronto4 Series4 Planar provides 8 utility bays. In addition to the modules, a steering ring actuates a vehicle’s steering wheel. Two steering ring options are available: a standard ring with a perpendicular motor connection, and a right angle motor connection that gives the actuator a much lower profile and enables the orientation of the motor shaft to be positioned in any direction parallel to the steering ring. As an operate-by-wire platform for research and development of sensors, software, etc. Kairos Autonomi, Inc., a worldwide leader in robotic appliqué kits and developer of the Pronto4 Robotic Appliqué Kit, announced today it has moved its global headquarters to a larger facility to support recent and future growth. Although America’s economy continues to sputter, Kairos Autonomi has flourished, becoming the largest robotic manufacturer by volume of full-size unmanned ground vehicle systems in the world. This expansion necessitated the move to a larger facility in order to provide enhanced operational efficiency and sustained growth opportunities. Kairos will also continue to follow its ISO9001:2008 Quality Management System in the new facility. Kairos was the first robotics company since 2007 to be ISO9001:2008 registered. Kairos Autonomi, Inc., a world leader in robotic appliqué kits and developer of the Pronto4 Robotic Appliqué Kit, has completed the 1st phase of its base year contract to deliver unmanned moving ground targets at National Guard Bureau training ranges across the United States. Working only two to three days at each range, the Kairos team modified the existing ranges and configured each of them for unmanned vehicle operation. Kairos personnel also installed radio infrastructure and ground control station hardware and software, and delivered an optionally unmanned moving ground target powered by the Pronto4. In addition to the hardware and software delivery and installation, Kairos personnel provided training to range personnel that will enable them to remotely operate the vehicles and maintain the radio and control station infrastructure for future missions. Kairos will complete phases two and three in the first half of 2013, and will continue releasing its Pronto4 Robotic Appliqué Kits to other ranges throughout the United States. The Pronto4 Robotic Appliqué Kit can be installed in about 4 hours by a trained team of two technicians. For each NGB range, the Pronto4 enables an unmanned vehicle to drive by remote control operation in conjunction with communications infrastructure. The Pronto4 can also be upgraded to provide GPS path following capability. The Pronto4 enables existing vehicles or surface vessels to be utilized as realistic, unmanned moving ground targets as part of training and test operations. Kairos supports a broad training range customer base and continues to develop cost-effective, high-quality hardware and software products for training range customers worldwide. We are excited to introduced a Camera Roll-off Filter to use along with the Pronto4 Robotic Appliqué Kit. The filter consists of a protective shield that fits over the standard Kairos Autonomi camera and mechanically self-cleans while the vehicle is in motion. This provides the camera with a clear view, as well as a longer lifespan that can shoot 100 frames through its own self-cleaning process. DRS Technologies, Inc. a Finmeccanica Company, announced its Sustainment Systems division has teamed with Kairos Autonomi, Inc. to jointly market, produce and support autonomous and semi-autonomous moving land targets for advanced aircraft training for U.S. and international military customers. Kairos Autonomi, Inc., a world leader in robotic appliqué kits and developer of the Pronto4 Robotic Appliqué Kit, has been awarded a contract by the Army National Guard for moving land targets. Kairos Autonomi will equip 12 Army National Guard ranges across the nation with Pronto4 Robotic Appliqué Kits, ground control stations and radio infrastructure. The hardware, software and infrastructure will provide each range with remote moving targets controlled from range facilities with full video and radio control. The Pronto4 is a robotic appliqué kit that allows vehicles to drive themselves by following a pre-defined GPS path or by remote controlled operation. The kit can be installed in most vehicles in about 1-2 man days. The kits provide realistic moving target that enhances realistic training and test environments for military personnel. Product deliverables at each range may include site infrastructure and support requirements, vehicles can also be configured for laser operations. The Period of Performance (POP) is expected to be 12 months. Kairos Autonomi, Inc., a world leader in robotic appliqué kits, has introduced a tele-op only kit that enables an existing vehicle to operate as an unmanned moving ground target. The tele-op only kit, which will be shown at the NDIA Targets conference and exhibition on Oct. 2-4, 2012, in Orlando, Florida, is engineered to meet specific market demands for a cost-effective, tele-op only kit that can be used in a destructive test or training requirement. Because the kit fills a specific market niche, it includes an upgrade path to become a smarter robot as required by operational requirements. 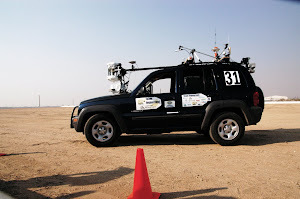 These upgrades include GPS path following, vehicle deconfliction and supervised autonomy capabilities. The tele-op only kit allows for vehicle operation at speeds in excess of 90 mph, giving the operator the maneuverability to adjust the vehicle’s route and speed with minimal time and effort. This decreases the potential for trainees to forecast upcoming preprogrammed scenarios during training exercises. The tele-op only kit comes pre-loaded with software and a built-in CPU, controlling the steering, transmission, brake and throttle actuation through a radio data link. The kit can include additional features such as alternative radio frequencies and video capability. Kairos Autonomi - 498 W. 8360 S. Sandy, Utah 84070 - Phone 801-255-2950 - www.kairosautonomi.com. Theme images by merrymoonmary. Powered by Blogger.